From the mountains to the coast, South Carolina's many art galleries and museums tell the story of an intriguing past and a flourishing cultural present. Discover inspiration in a captivating work of art or a compelling historical exhibit. Explore South Carolina museums for a peek into what inspires us here in the Palmetto State. South Carolina museums house the stories of our diverse culture and unique Southern heritage. From dinosaurs and sharks to Picassos and Gullah landscapes, it's all here. 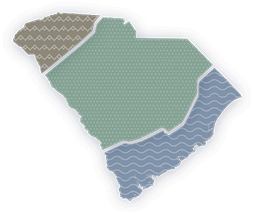 From basket weavers to master potters, the Palmetto State is filled with world-class artisans from mountains to sea. As South Carolina's oldest city, Charleston has many museums to explore. Discover the city’s history, arts and culture at more than a dozen locations. From the South Carolina State Museum's planetarium and observatory to the Columbia Museum of Art's array of visiting exhibits, there's always something to discover in the capital city! Take a trip to the Emerald City to explore the history of The Upcountry! With many museums and interactive exhibits, Greenville is filled with hands-on experiences for the whole family. Explore the history, cultural heritage and coastal ecology of Hilton Head Island, from the Coastal Discovery Museum and educational programs to tours of the Gullah Heritage Trail! Discover the past of the Grand Strand, an area rich with culture, history and natural wonders. Step past the surf and sand to experience and interact with Myrtle Beach's many marvels. Small-town South Carolina is full of fun and interesting places to learn about and experience history and culture. Discover the stories of South Carolina's past from the mountains to the coast. Visit Huntington Beach State Park and explore the beautiful open-air Atalaya Castle. One of the best times to visit the castle is during the Atalaya Arts and Crafts Festival, when more than 100 artists fill the castle with their unique creations. Inspired by the Japanese Tea Garden at Golden Gate Park in San Francisco, the Wells Japanese Garden is a truly unique sight to see in South Carolina. Be sure to stop by the next time you’re in downtown Newberry. From J’s Tea-rific Teapot Museum to Ripley’s Believe it or Not Odditorium, the Palmetto State is home to some eclectic institutions. Check out our top 5 picks for where to visit if you’re looking for something a little different on your next family outing.